I made this for Pi Day (3-14). We had Shepherd's Pie for dinner and ice cream pie for dessert. Jack was home for spring break, and I couldn't let a major holiday like Pi Day go uncelebrated. The pie is simple to make with literally 5 ingredients...and you have to make it several hours ahead of serving, so it's perfect when you have company for dinner. The pie starts with a Nutter Butter crust. I'm warning you now, you'll have leftover Nutter Butters. Eat them or hide them...it's up to you. Crush them up in your food processor. 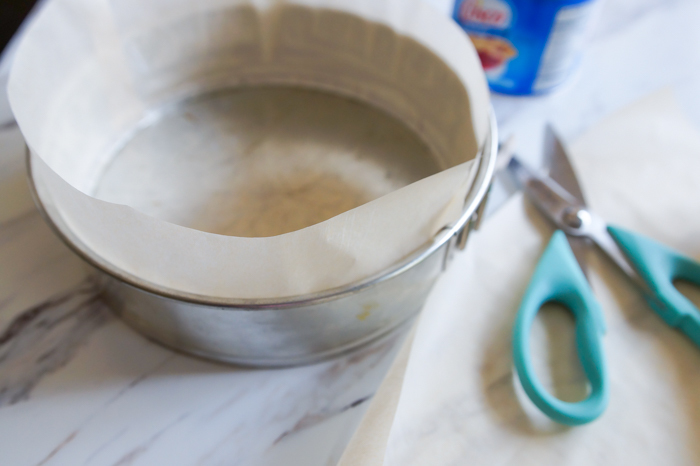 Before adding them to the pan, grease the sides of a springform pan and then line just the sides with parchment. Then, place some the crumbs in the bottom of the pan. The crust doesn't need butter to hold it together...the ice cream will do that in a few minutes. Leave the remaining Nutter Butter crumbs in the food processor and add 2 pints of chocolate ice cream. I use the word "pint" here loosely as pints of ice cream have been shrinking lately. I used Haagen-Dazs chocolate, and their "pints" are 14 ounces. Your food processor may struggle a bit with the ice cream, so remove the lid and push it down to the blade as needed. 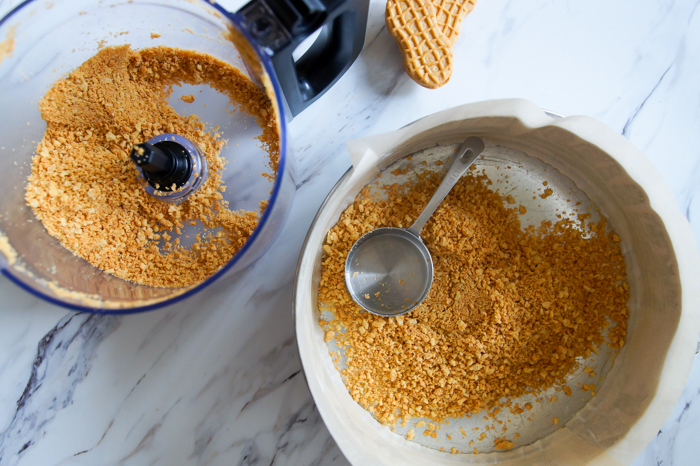 You just want to incorporate those crumbs; don't liquify the ice cream. 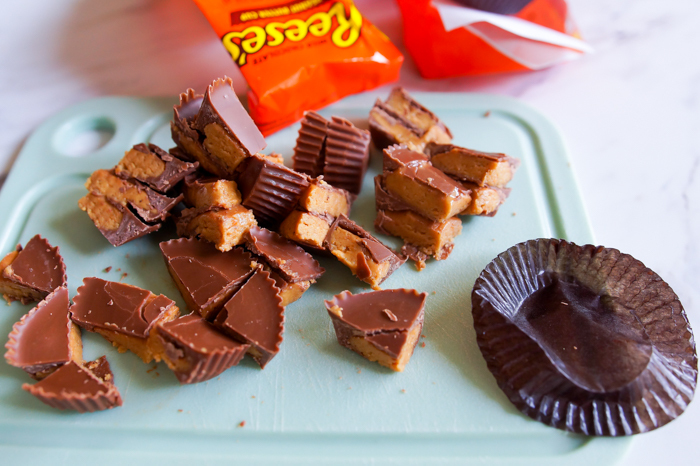 Next, you'll stir in chopped Reese's Peanut Butter Cups. Oh, did I forget to mention that there are peanut butter cups in here? There are. 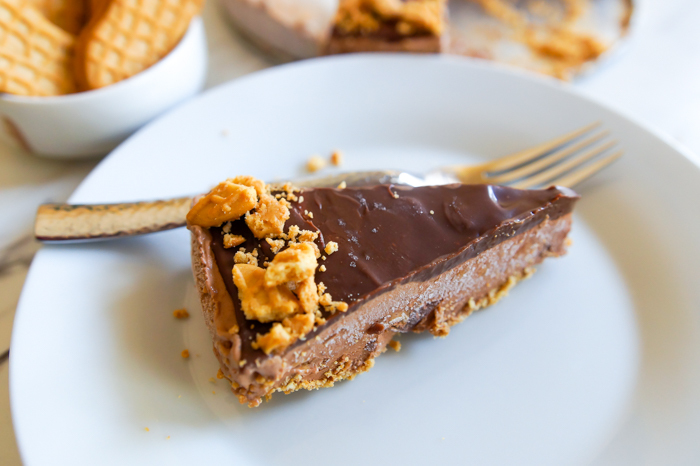 How could I make a chocolate peanut butter ice cream pie without them? Stir them in. Gently spread the ice cream mixture onto the crumb crust, trying not to disturb it too much. Freeze for a few hours. The crowning glory: ganache. 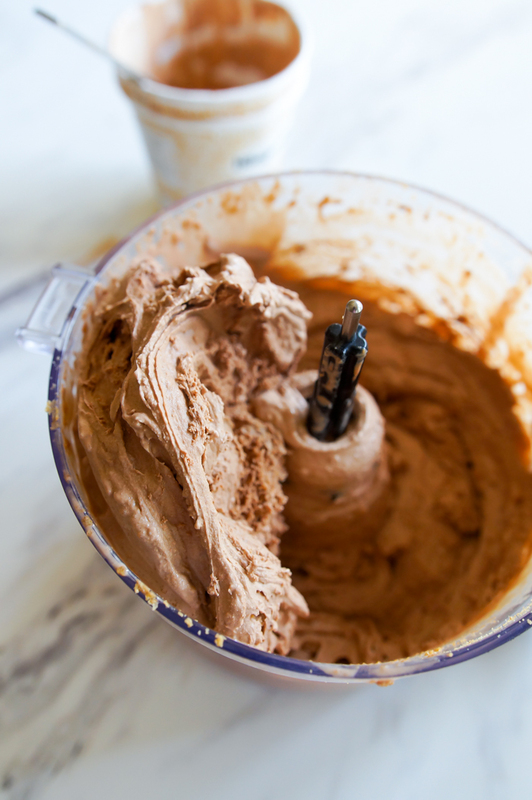 You'll whip up a little ganache and quickly spread it onto the ice cream. It's not a thick layer; it's a Goldilocks layer...just right. Break up a few more Nutter Butters and scatter them around the edge. Freeze again. When ready to serve, remove it from the freezer for about 10 minutes before slicing. I like to dip a knife in a glass of hot water (and wipe it off) for easier slicing. Grease the sides of a 9" springform pan. (I like Crisco.) Line the sides only with parchment paper cut to about 4" tall. Pulse the 6 ounces Nutter Butters in a food processor until crumbs form. Scoop 3/4 cup crumbs into the pan and distribute evenly. Add the ice cream to the remaining crumbs in the food processor. Pulse until combined, stopping to push the ice cream down into the food processor bowl as needed. Place the ice cream in a large bowl. Stir in the chopped peanut butter cups. 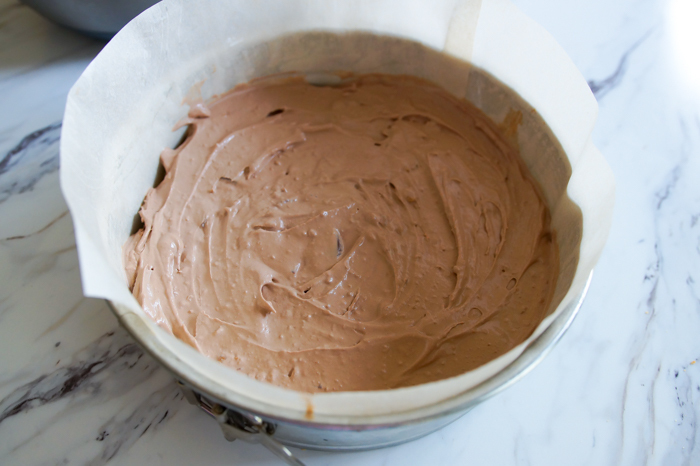 Gently spread the ice cream mixture into the pan, trying to disturb the crust as little as possible. Smooth the top. Freeze for 3 hours. After 3 hours, bring the cream to a simmer over medium heat. Pour over the chocolate chips. Let stand 5 minutes, then stir until combined and smooth. 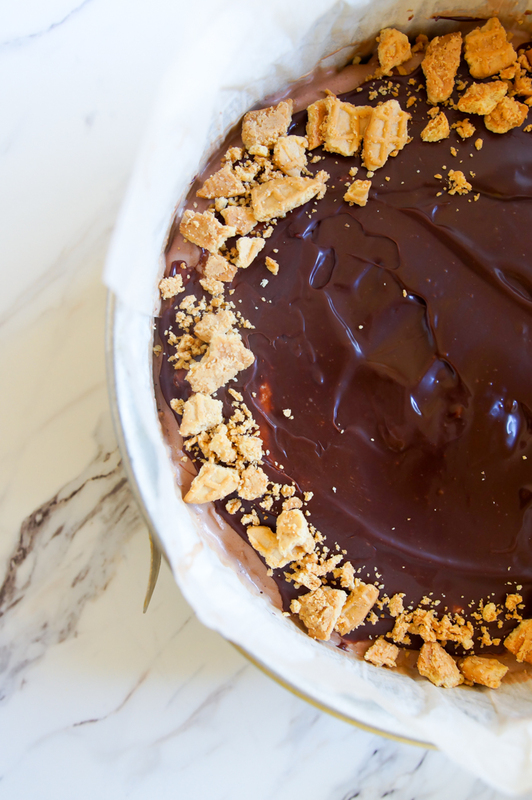 Remove the pie from the freezer and quickly smooth the ganache over the ice cream layer. Break up a few more Nutter Butters into large chunks and scatter over the edge of the pie. Return to the freezer for at least one more hour. Before serving, let the pie stand at room temperature for 10 minutes. Release the side of the pan. Dip a knife into a glass of hot water. Wipe off the water with a dish towel and slice the pie. 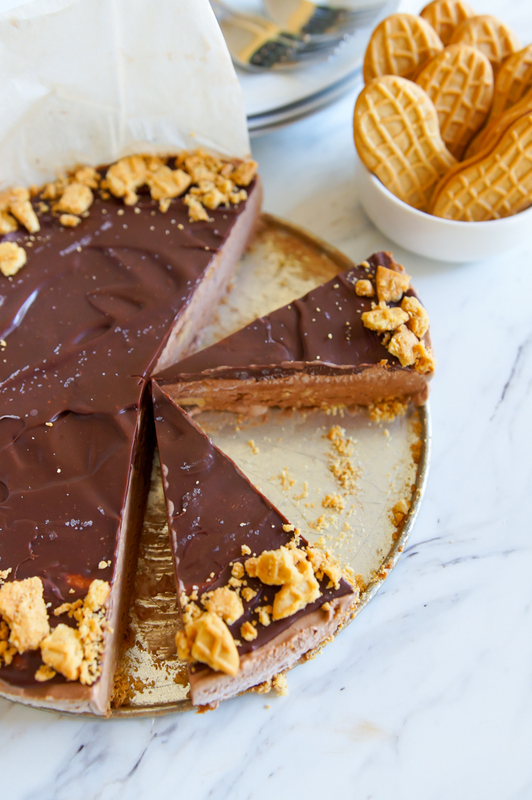 Chocolate Peanut Butter Ice Cream Pie. Mr. E loves it. You will, too. 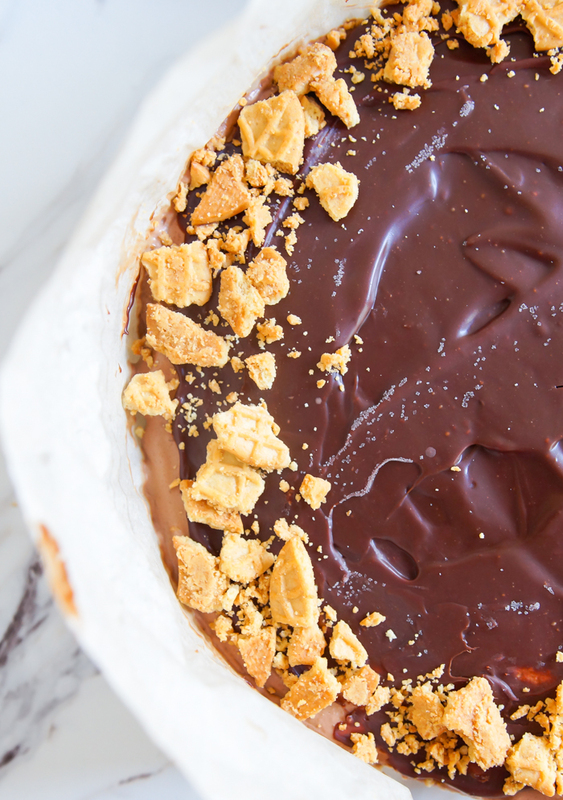 Now that is a fabulous chocolate peanut butter recipe. 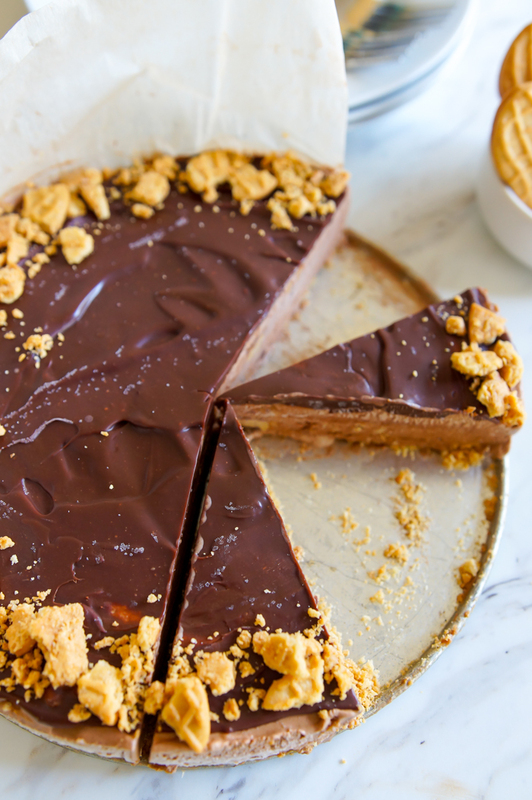 Just perfect, mostly chocolate with pb. I just had a realization that I could also make this pie as a two person dessert if I just used a smaller pan. Of course, that does mean more nutter butters don't have a dessert to go in to. 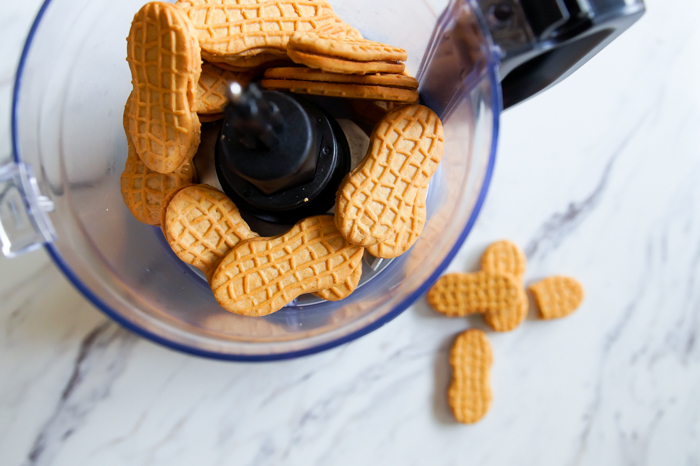 When I was in high school I worked at a soda fountain and one of my friends who worked there too loved to make chocolate milkshakes and lightly crush the packs of peanut butter crackers and put them in it. This would be the grown up version and even more fabulous.